If an abundance of zucchini puts you in the mood to party, we suggest starting the festivities with these elegant and colorful cheesy roll-ups. Use vegetable peeler to cut each zucchini into 16 lengthwise slices. Cut peppers into 32 strips, each about 1/2 inch wide. Top each zucchini strip with 1 each pepper strip and cheese cube; roll up tightly. Prepare using 4 KRAFT Big Slice Sharp Cheddar Cheese Slices. 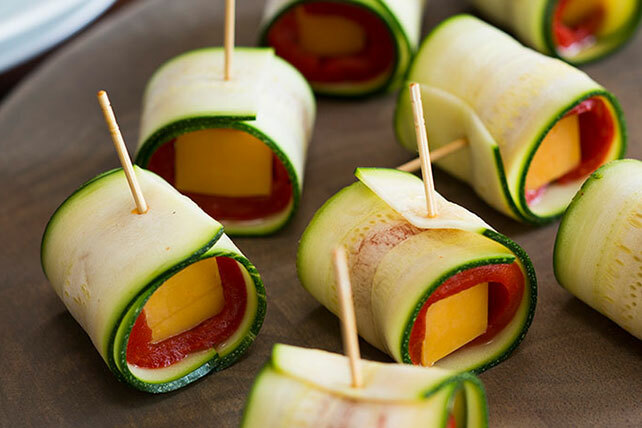 Cut each cheese slice into 4 lengthwise strips, then roll up with zucchini and pepper strips. Prepare using a fresh red bell pepper, cut into 1/2-inch pieces.